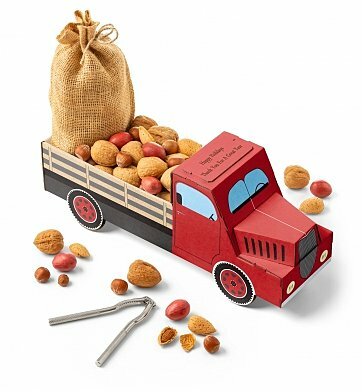 Imagine the surprise when this vintage delivery truck arrives bearing a collection of whole nuts in a cute burlap sack, along with an enduring stainless nutcracker. With your personal message printed on the truck's roof, this fun and deliciously shareable gift is sure to leave a lasting impression. Burlap Bag of Mixed Whole Nuts, 12 oz. Contains Walnuts, Hazelnuts, Almonds and Pecans. One Stainless Nutcracker, 4.5" Long. if ordered by 11:00 am EDT Wednesday April 24th. Special Delivery Nutcracker and Nuts is a hand delivered gift. These gifts are delivered by one of our local design centers located throughout the United States and Canada. Same day delivery is available for most gifts when ordered before the cutoff time. The cutoff time for Special Delivery Nutcracker and Nuts is 2 PM in the recipient's time zone. Whole mixed nuts include almonds, walnuts, hazelnuts and more. Holiday truck includes complimentary personalization on truck's roof. Includes a free note card bearing your personal gift message.